On Sunday we vended at the Sunday Emporium event at Rejuvenation in Portland. We spent all week working on some very special projects for this event. We finished them in the nick of time. Our pieces looked beautiful paired with the modern lighting at Rejuvenation. Our Plycraft chair upholstered in Pendleton wool was one of the first items to sell. One of the projects that we worked on all week was this Adrian Pearsall rocking chaise. Sold. 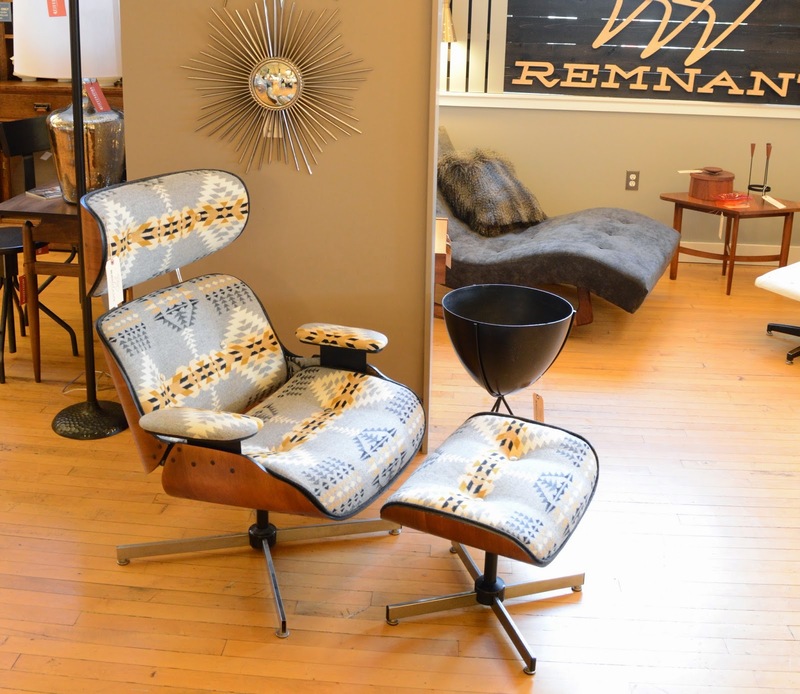 (Right) When we reupholstered this Plycraft lounge chair and ottoman we left the wood in the armrests exposed. It's a big improvedment over the condition we found it in. Lastly we upholstered this beautiful set of teak and oak armchairs by Moblenord.